Justin and Nichole get married! Home / All / Justin and Nichole get married! This was a great event, I wish I could post a hundred pictures from it! 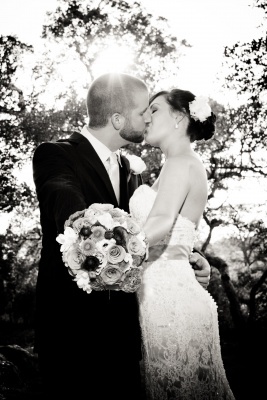 Nichole and Justin said their vows over looking the beautiful Guadalupe river in Boerne at the Marquardt Ranch. It was a perfect evening for a wedding, the sun was setting there were butterflies everywhere. Nichole looked gorgeous in her custom gown. She had it hand altered to make it unique to her. She chose a beautiful coral pink accented with bright summer colors for her flowers. Immediately following the wedding all the guests headed inside for a lovely cocktail hour while the bride and groom took family and couple pictures. The reception was a wonderful, guests were served huge portion of brisket and chicken with barbeque sauce, mixed veggies, garden and potato salads. Following dinner the bride and groom cut their beautifully deocrated brides cake and fun fishing boat grooms cake. DJ Mike Lavender, of Lavendar Entertainment, softly serenaded the guests as they enjoyed their food then rocked out the Texas Country until the end of the party. Nicole and Just left through a tunnel of sparklers with a long kiss goodnight. Congratulations you two!